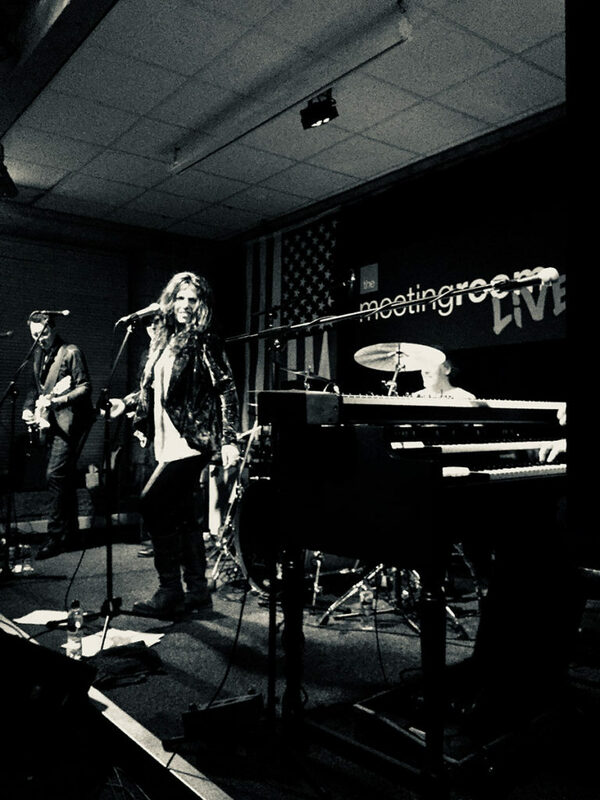 As usual in this part of the country, it’s a blustery Saturday evening and the band are just setting up and we’re getting ready to open the doors to welcome Sari Schorr to The Meeting Room. First up, we have piano virtuoso Dan Burnett as a warm-up act for the night. 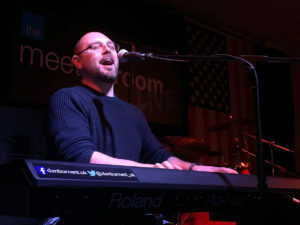 I have had the pleasure of sharing a stage with Dan before and have seen him play a few times and he still astounds me. The effortless way he shreds the keys (that’s right… shreds!) along with his beautifully clear, emotive vocals makes the audience unable to look anywhere but the stage (with exception of the “usual” loud-mouthed woman who doesn’t take hard stares as a hint to shut up… AGAIN!!). Dan’s original material is very much written from his own experiences (good and bad) which means he delivers them in a way that makes you feel like an intruder on a very personal moment, in a good way of course. Dan opened up with a funky little number named “Happiest man alive” and it was clear from the get-go that even though Dan was a one-man warm up, he was more than capable of filling the stage and getting the attention of everyone there. He delivered a classy set with a very eclectic range of songs, from the boogie feel of his original track “hungover again” to the storytelling, heart breaking vocals on “battle scars” it seems Dan Burnett can do it all and he was the perfect contrasting warm-up act for what was to come. Sari’s reputation proceeds her as a phenomenal vocalist with an awesome stage presence and I had been looking forward to this since she was booked (I love me a female vocalist!). With Sari, we had the phenomenal 6 strings of Ash Wilson, the big bad bass of Meeting room regular Matt Beable (who keeps popping up), the metronome-like beats and very filling fills of Roy Martin on the drums and the tinkering and serious twiddling of Bob Fridzema on keys. Sari herself is a very accomplished vocalist who has a rawness to her voice which can be both tender and fierce. Her gravelly tone allows her to really rock up such numbers as the opening track “Revolution” which wails in the chorus, but she can also deliver the ballad style tracks with those big powerful notes and whispery tones like in her song “ordinary life”. Sari and the fellas delivered a phenomenal show and were genuinely lovely to chat to. No ego’s, just talent. There were moments within the show where each musician came into their own and shone on the stage. Ash Wilson is an incredibly versatile guitarist who can pretty much play anything and play it very well. He is also the best “face puller” you have ever seen. Bob is just a cool dude who looks like he is enjoying every moment being on stage. He is a mass of smiles and a real pleasure to watch and listen to. Roy and Matt are seasoned professionals who work incredibly well as the “back line” or even better as “the backbone”. 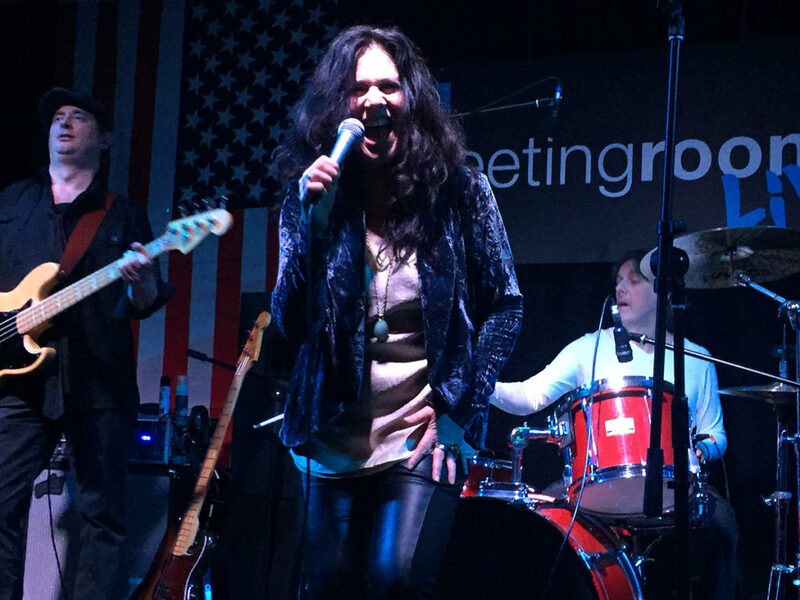 Sari’s stage presence speaks for itself through her reputation as a great performer and top vocalist on the blues/rock scene, it also helps that she looks and moves great on stage. The guys all seemed to be having a good time which was also true of the The Meeting Room audience. We wish Sari and the guys all the best of luck for the rest of the tour and hoping we may see her again next time she is over from her home town (city) of New York.